Saturday, 9:00 am to 2:00 pm. Acupuncture, Herbal Consultation, Tuina & Shiatsu, Reflexology, Qigong, Rolfing, Massage, and Energy work are available. Gift certificates are available for acupuncture treatment. Special acupuncture fee consideration is offered for lower income clients. 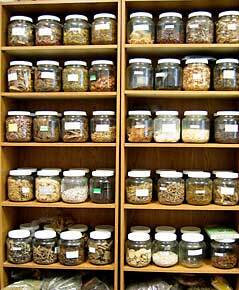 The herbal pharmacy stocks hundreds of varieties of Chinese herbs, including raw herbs, powdered herbs, patent formats, tablets, capsules and liniments. The herbal pharmacy fills prescriptions for the practitioners as well as for many licensed practitioners in the local area. The goal is to provide high quality, high purity and effective herbs at a low cost to our patients.